On December 1, 2018 at approximately 10:30 a.m., Trooper Posch responded to the 45000 block of Take It Easy Ranch Road, in Callaway, for a suspicious vehicle. The complainant reported the vehicle, a blue and tan Chevrolet 1500 Z71 bearing VA registration, had been parked in the woods behind the campground for approximately six days. A check with Virginia revealed the vehicle was reported stolen thru Brunswick Virginia Sheriff’s Office. Investigation revealed the vehicle was stolen by an escaped fugitive, Cul Priest Lamont Jones, (B/M, 45 years old, 6’0”, 180lbs), from Hoke County Correction Facility in North Carolina. A search of the area was conducted, but Jones was not located. 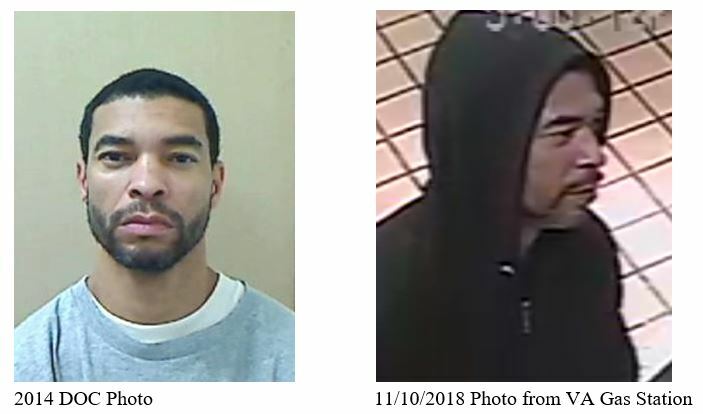 Based on information from North Carolina Highway Patrol and Brunswick County Sheriff’s Office, Jones should be considered armed and dangerous. Jones’ prior convictions include Assault with a Deadly Weapon, Attempted Murder, Breaking and Entering, and Theft of a firearm. Jones should not be confronted if located. Jones could still be in the area. If seen, please call 911. This entry was posted on December 3, 2018 at 11:42 am and is filed under All News, Calvert News, Charles News, County, Law Enforcement, St. Mary's News, Top News, z 600X120 Top Ad Bottom, z 600X120 Top Ad Top. You can follow any responses to this entry through the RSS 2.0 feed. Thank you vigilant neighbor! See something, say something! Well, at least he knew to head to the south end of the county. I’m sure he’ll make to it to Great Mills and just sort of fall off the face of the earth. I’ve never seen the guy in the blue shirt…But, I’m pretty sure that guy in the hoodie is Ice-T. Bahahahah!!!! Good call. He must have a show over at the Calvert Marine Museum. Those are two different pictures of the same person taken 4 years apart. I have .357 reasons he shouldn’t come near me or mine. So you have less then 1/2 of a reason why they shouldn’t come near you. Genius! I’ll bet that he’s hiding out in one of the trailers in the Take It Easy trailer park. I’ll also bet that there will soon be some “break ins” reported so the jackass can buy food. You’ll see him at a neighborhood store or even the food lion very soon. Why are security cameras so much clearer in VA? It is obviously due to global warming. It’s Trumps fault, like everything else.